Anthropogenic carbon dioxide emissions do not only warm our planet but also acidify our oceans. It is currently unclear to which degree Earth’s climate and marine life will be impacted by these changes but information from Earth history, particularly the geochemical signals of past environmental changes stored in the fossil remains of marine organisms, can help us predict possible future changes. This book aims to be a primer for scientists who seek to apply boron proxies in marine carbonates to estimate past seawater carbonate chemistry and atmospheric pCO2. Boron proxies (δ11B and B/Ca) were introduced nearly three decades ago, with subsequent strides being made in understanding their mechanistic functioning. This text reviews current knowledge about the aqueous systematics, the inorganic and biological controls on boron isotope fractionation and incorporation into marine carbonates, as well as the analytical techniques for measurement of boron proxies. 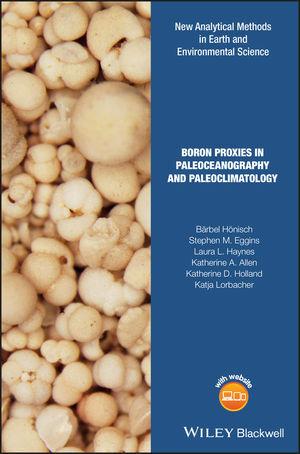 Laboratory and field calibrations of the boron proxies are summarized, and similarities between modern calibrations are explored to suggest estimates for proxy sensitivities in marine calcifiers that are now extinct. Example applications illustrate the potential for reconstructing paleo-atmospheric pCO2 from boron isotopes. Also explored are the sensitivity of paleo-ocean acidity and pCO2 reconstructions to boron isotope proxy systematics that are currently less well understood, including the elemental and boron isotopic composition of seawater through time, seawater alkalinity, temperature and salinity, and their collective impact on the uncertainty of paleo-reconstructions. The B/Ca proxy is based on the same mechanistic principles as the boron isotope proxy, but empirical calibrations suggest seawater pH is not the only controlling factor. B/Ca therefore has the potential to provide a second carbonate parameter that could be paired with δ11B to fully constrain the ocean carbonate system, but the associated uncertainties are large. This text reviews and examines what is currently known about the B/Ca proxy systematics. As more scientists embark on characterizing past ocean acidity and atmospheric pCO2, Boron in Paleoceanography and Paleoclimatology provides a resource to introduce geoscientists to the opportunities and complications of boron proxies, including potential avenues to further refine them. Bärbel Hönisch, Department of Earth and Environmental Sciences and Lamont-Doherty Earth Observatory of Columbia University, USA. Stephen M. Eggins, Research School of Earth Sciences, The Australian National University, Australia.